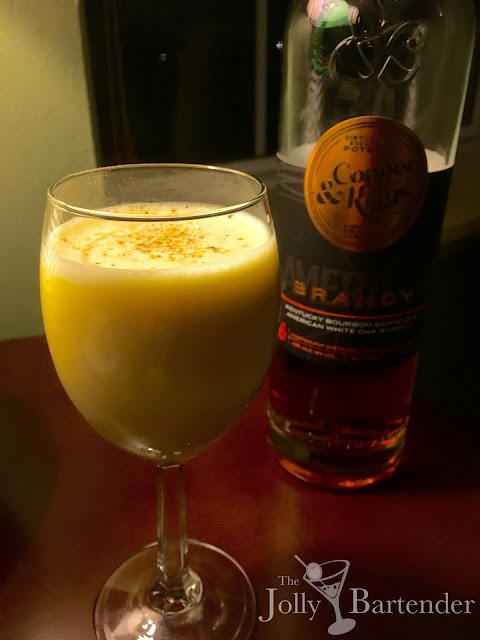 A flip is a dessert drink that takes any spirit and shakes it up with a whole egg, sugar, and cream and is topped with a sprinkle of nutmeg. The Brandy Flip, by nature of its being a primogenitor of early Industrial Era spirits, is likely to be the first kind of flip--unless you count sherry or porto. Let's say that this drink goes way back to the first mixing of distilled spirits with eggs, sometime in the early 1700s. Combine all ingredients except nutmeg in a shaker with ice. Shake and strain into a chilled sour glass. Garnish with sprinkles of nutmeg.